San Francisco’s gang injunctions are unique and have always been designed to protect civil rights while achieving public safety. They are effective and focused. In the years since the injunctions were put in place, many of the named gang members have quit their gangs. One of the gangs, Knock Out Posse, crumbled altogether and is now no longer an organized gang. In light of the changed circumstances and improved public safety, Herrera in April 2018 launched a comprehensive review of the gang injunctions. As part of that review, he filed legal motions asking the San Francisco Superior Court to modify the injunctions to remove individuals who were no longer engaged in criminal gang activity. 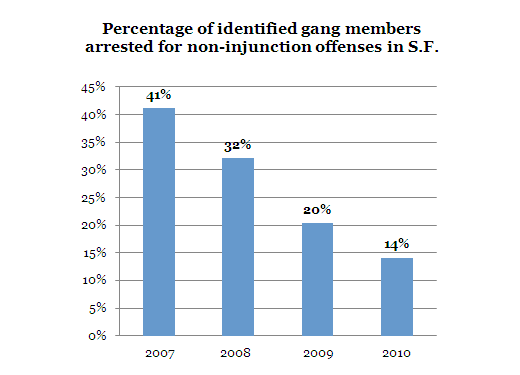 The Effectiveness of Civil Gang Injunctions in S.F. While it is often difficult to draw conclusions about causality from crime statistics, anecdotal evidence indicates that San Francisco’s civil gang injunction program has played a role — alongside the work being done by San Francisco’s Police Department and San Francisco’s District Attorney — in reducing gang related violence and nuisance conduct. In all four gang injunctions, crime by enjoined gang members within the safety zone dropped. Felony convictions for those members before the injunctions totaled 104. After the injunction, the amount dropped to 58. An internal analysis of arrest data by the San Francisco City Attorney’s Office suggested another important effect of civil gang injunctions: a general “cooling off” effect among gang members named in the various injunctions, who had markedly fewer arrests citywide following the imposition of injunctions. Since San Francisco’s gang injunction program was launched at the end of 2006, 46 percent of identified gang members (43 of 93) had gone without even a single arrest in San Francisco for crimes other than minor violations of the injunction itself in 2010. The data also show progressive improvements over time, with only 14 percent of identified gang members (13 of 93) arrested for non-injunction crimes to that point in 2010 — down from 41 percent in 2007. Gang Arrest Graph 2007-2010, showing the percentage of identified gang member arrests dropping dramatically after the Civil Gang Injunction program was implemented. No injunction has resulted in an observable migration of gang-related crime or nuisances to adjacent areas or to different neighborhoods, as evidenced by citywide arrest data and observations by experts from the San Francisco Police Department’s Gang Task Force. In addition to the statistics on the effectiveness of San Francisco’s gang injunction program, the following are two independent studies of civil gang injunctions in other California jurisdictions that indicate their effectiveness in helping to abate gang-related violence and nuisance activity. 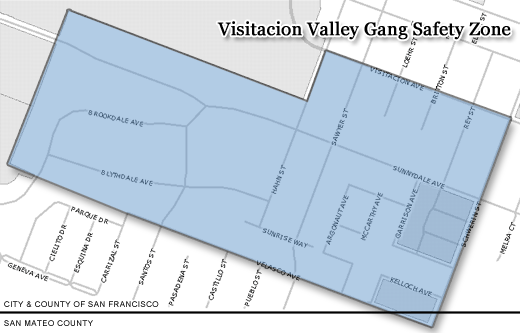 Visitacion Valley Civil Gang Injunction On Aug. 5, 2010, the San Francisco City Attorney’s Office filed suit against two warring criminal street gangs that have terrorized San Francisco’s Visitacion Valley for more than three years. The civil complaint filed in Superior Court names the “Down Below Gangsters” and “Towerside” gang as defendants in an action that seeks to prohibit an array of gang-related criminal and nuisance conduct by 41 adult gang members within a proposed “safety zone” covering less than two-tenths of a square mile. The resultant safety zone is an approximately .18 square mile “L” shaped area bordered by Schwerin Avenue, Visitacion Avenue and Hahn Street, and the Sunnydale Public Housing Development’s northern, western and southern borders, the latter of which then proceeds along Velasco Avenue. The safety zone encompasses both known gang turfs together with an adjoining buffer zone between and near the two turf areas.